Today we celebrate the memorial of St Benedict, Abbot, Patriarch of Western Monasticism. So it’s good to stop for a while and have a chat with him. Junjun Faithbook: St Benedict, good day and thank you for this opportunity of chatting with you. For the sake of our audience, do you mind introducing yourself? St Benedict: No, not all. Well, as you’ve mentioned, my name is Benedict. I was born around the year 480 at Norcia, Italy. That introduction would be enough, my childhood is not really that worth telling. There is not much record on it anyway. Junjun Faithbook: You have said it. Anyhow, could you tell us about your Educational background then? Junjun Faithbook: Fancy that! You’re spoiled! And you liked that, did you? St Benedict: Who couldn’t? But it wasn’t really that consoling. Junjun Faithbook: What do you mean? St Benedict: I don’t like the influences around me then. My companions were living in such a low moral standard, that I decided to leave Rome for good. Junjun Faithbook: And you managed? St Benedict: Yes, of course. With my ‘housekeeper’ or ‘nurse’ I escaped without telling anyone. Junjun Faithbook: And where did you go? St Benedict: We went to the village of Enfide, in the mountains about 30 miles from Rome. Junjun Faithbook: Did you find peace there then? St Benedict: At first yes. Only because I thought then that if I could get away from the temptations of Rome, I would be alright. However, I realized I was called to something deeper. Junjun Faithbook: You have discovered your vocation then? St Benedict: Sort of. So I went alone to a much higher place, on the hills of Subiaco. Junjun Faithbook: And you found peace in that wild and rocky country at last? St Benedict: Not as yet, I would say. I met a monk there by the name of Romanus. I told him everything my heart desired. I also told him then that I wanted to live a life of a hermit. Junjun Faithbook: Did he help you in discerning about it? St Benedict: Absolutely! He assisted me. He even ‘clothed’ me with a sheepskin habit and led me to a cave in the mountain. There I lived on my own. Junjun Faithbook: So the Monk left you on your own then? St Benedict: Not really. For three years, he was the only one who knew my whereabouts. He kept it secret from anyone. Junjun Faithbook: And how did you get your daily sustenance? 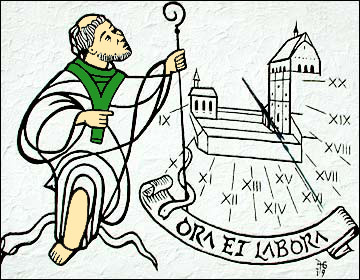 St Benedict: The monk Romanus brought bread to me daily who drew it up in a basket let down by a rope over the rock. Junjun Faithbook: That’s what I would call fraternal dedication and concern. Junjun Faithbook: And so, you must have enjoyed the solitude there? St Benedict: At the beginning, yes. But people started coming to gather around me. Their reason was that they were attracted by my holiness and by miraculous powers. Junjun Faithbook: Saints always shine indeed. And you just can’t deny yourself of that privilege so to speak. By the way, who were these people who came to you? St Benedict: Some of them were just wanting to flee from the world. And some were solitaries who were living among the mountains. Junjun Faithbook: Did you gather them then as one community? St Benedict: I tried them if they would obey me. I asked them to settle in ‘twelves’ into a twelve wood-built monasteries, and assigned a prior to each of those monasteries. Junjun Faithbook: So you didn’t really have to oversee all of them? St Benedict: No, expect those monks I have trained especially for something, so they were under my direction. Junjun Faithbook: In a way, you’ve established your monastery there as a firm and stable community? St Benedict: In a way, yes. But I actually just set things in order. St Benedict: When I saw it certain that they could manage, I withdrew from Subiaco to Monte Cassino. St Benedict: It is a solitary elevation on the boundaries of the Campania, commanding on three sides, narrow valleys running up towards the mountains, and on the fourth, as far as the Mediterranean. Junjun Faithbook: Sounds very convenient for solitude. St Benedict: Certainly! In fact, I initiated the building of the two chapels there, around which lay the foundation of a great Abbey. Junjun Faithbook: And what year was this built? St Benedict: Around the year 530. Junjun Faithbook: You must have been in your middle age by then? And you must have enjoyed being a hermit there? St Benedict: For certain time, yes, but then people who wanted to follow my lifestyle started coming to Monte Cassino too. Junjun Faithbook: And you welcomed them? St Benedict: I couldn’t turn them away. So I gathered them together in one community, appointed a prior over them and deans as well. Yet they still looked up to me for general supervision. Junjun Faithbook: And besides your disciples, would you also take other people into your Monastery? As guests perhaps? St Benedict: Yes, hospitality is one of our major rules. So it had become necessary for us to build more guestrooms to accommodate these people? Junjun Faithbook: Are they basically lay people who were attracted to your simple and well-ordered lifestyle? St Benedict: There were also dignitaries of the Church who would come and ask advice at times. Junjun Faithbook: People would come to you because of your reputation of holiness, wisdom and even miracles. Have you realized that? St Benedict: I just did what God wants me to, and I was just being myself. Junjun Faithbook: How about the famous Rule of St Benedict that is being followed now by Benedictines and Cistercians around the world, did you compose that around your time in Monte Cassino? St Benedict: Around that time yes. Junjun Faithbook: It really had made such an impact to people. The people in your time then, especially those who were living in the surrounding country would testify that you cured their sick, relieved their distress, distributed alms and food to the poor, and even said that you raised the dead on more than one occasion, did not all these make you proud of yourself? St Benedict: It is God who made all those things to happen through me. So what am I to be proud of? Junjun Faithbook: How about the story that you even told your disciples your imminent death six days before it actually happened to you, and thus you asked them to make a grave ready for you? St Benedict: Again, it is God’s doing. Junjun Faithbook: Let’s praise God for his great love made manifest you St Benedict. Thank you so much for your life and example. Through your famous Rule, we have learned so much how to balance prayer and work, charity and moderation, and how to make these basic elements of our life, a way for our sanctification. On the last day of St Benedict’s life, he received the Body and Blood of the Lord. With the help of his brothers in the monastery, he was able to stand up in the chapel, with his hands uplifted towards heaven, and breathed his last on the year 547. In 1965, Pope Paul VI declared him Patron Saint of Europe. St Benedict of Nurcia, pray for us. Great interview Fr Junjun. And a great saint. I’m surprised, though, that St Benedict didn’t say anything about his famous sister. Perhaps you can contact him for a follow up? I like the format of this post and found it a very interesting read!